Axe Cop, Flute Cop, Grey Diamond, Army Chihuahua and Liborg help fellow superhero Bat Warthog Man find his missing friends. 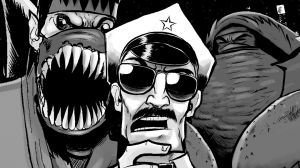 Axe Cop and Flute Cop look for a kidnapped British scientist and travel to the Zombie Island planet to help save a queen. 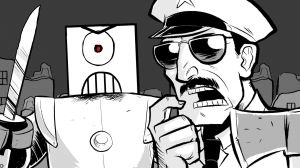 AXE COP tells the story of how his great-great-great-great-great-great-great-grandfather, Book Cop, invented the Fourth of July. When FLUTE COP finally has enough money to take his wife, Anita, on a romantic anniversary trip to Hawaii, he enlists AXE COP to babysit his daughter, Unibaby. Unfortunately, AXE COP hates babies and just wants to have fun, so he steals Unibaby's magical horn to transport himself to Magic World, along with Dr. Rang and Chubby Doll. 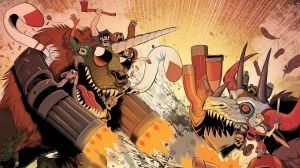 AXE COP's birthday month is not going as planned when he accidentally murders a group of good mermaids. However, FLUTE COP and DR. 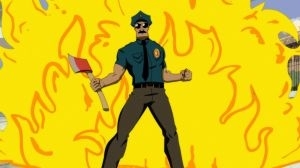 RANG give AXE COP the best birthday present ever: finding out who killed AXE COP's parents - BAD SANTA. 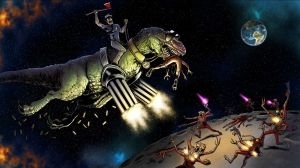 AXE COP travels to South Pole World in order to find BAD SANTA and bring him to justice. 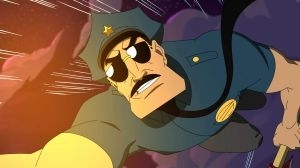 AXE COP gets a lesson in parenting when a mysterious, silent boy shows up asking AXE COP to be his father. After some nudging by FLUTE COP, AXE COP brings the boy to his Tri-Annual Learn Out camp to teach him how to kick and chop heads off. However, no one knows that the boy happens to be possessed by the soul of AXE COP's first kill: a rabbit that broke all the rules by eating coconuts. August 24th 2013 Genre rating added by Administrator. August 24th 2013 Genre added by Administrator.